You won’t find a word about it in the main stream media. You won’t find a word about it from the Alan Guttmacher Institute or Planned Parenthood, but the concept is so simple I could explain it to a five year old in about ten seconds. Even a small child would know that the jar does not reveal enough information to know an unknown total. Yet this is exactly the trickery the “reproductive freedom” powers-that-be in the United States are trying to pass off on the public. It is being claimed that the “birthrate for U.S. teens is the lowest in history“ because a new report from the Centers for Disease Control and Protection (CDC) says that ”the U.S. teen birth rate declined 9 percent from 2009 to 2010, reaching a historic low at 34.3 births per 1,000 women aged 15–19; the rate dropped 44 percent from 1991 through 2010.” (Report is here.) This is being attributed, in part, to the increased use of contraception and tied to the HHS contraception mandate. Surprise! The reproductive health folks point to this statistic and say, “See you backward Catholics! We told you that contraception works. Or do you just want teen girls running around the country becoming mommies so you can punish them?” And so will ensue, from the blind followers, cat calls of misogyny and wars on women. Only now it’s even going to be a war on teens. Watch for it. There’s a political jargon term used to describe uninformed people who allow themselves to be manipulated as propagandists and used by the leaders of a cause to achieve goals they do not understand…but it’s pejorative so I won’t use it. Adults should know better though. Here’s why this number is meaningless. 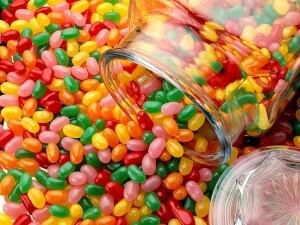 Back to the jellybeans. The number of jellybeans are like the number of pregnancies among teens (or any group of women) in the U.S., and that is the only number that really matters as it relates to teen behavior unless abortion is an acceptable solution. We do not know whether teen pregnancy has declined or not because we do not know the number of pregnancies aborted during that same time. To toss out the number of births as if it were meaningful is akin to the child’s game scenario above – there’s an unknown amount more than is shown. Sure some people say, “Oh, the estimates are pretty close so we can extrapolate.” Nonsense! Even in states that choose to require abortion reporting, there is absolutely no regulation of the reporting. Abortion clinics literally make the choice (they love choice!) to put information on a form and submit it to the state, or not. No regulation. They could toss the paperwork out, never fill the paperwork out at all, or fill the forms out dishonestly. It’s a black hole. Likewise, once the state agencies have the clinic information submitted, there’s no accountability to the public for methodology or accuracy for even reporting the data they receive. The states report whatever number they want to report, period. It is a fabricated number. Abortions + Births = Pregnancies. If we don’t know the first number, we can’t know the last. Don’t be fooled. This new CDC report of the ”lowest teen births in all of U.S. history” is misleading, a sham to push an agenda. Only this isn’t child’s play and candy – this is human life, religious freedom, and the integrity of the future we actually do leave to our children.